There are unconfirmed reports tonight that one of capital’s leading militias, the Tripoli Revolutionaries’ Brigade of Haitham Tajouri, has declared a state of emergency following today’s apparent seizure of three ministries. While Presidency Council head Faiez Serraj was in Cairo meeting Egyptian president Egyptian President Abdel Fattah Sisi, militiamen backing Khalifa Ghwell and his resurrected Government of National Salvation attacked the ministries of Defence, Labour and Martyrs’ Families, Wounded and the Missing. PC spokesmen Ashraf Al-Tulty insisted that attempts to occupy the ministries had been seen off. Another PC source said that at least two of the buildings had been re-taken. Nevertheless Ghwell broadcast this afternoon from what seemed to be the defence ministry. He said that the PC and the Government of National Accord had failed. Conditions had gone from bad to worse since they arrived. The Skhirat agreement was dead. The Libyan Political Agreement which had been imposed by foreigners was over. It was now time for a Libyan Libyan agreement. 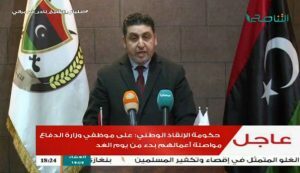 “The National Salvation Government is open for cooperation with all military formations in establishing the state authority” he said, adding that what Libya needed was an end to armed militias. It is also reported that Ghwell went to the labour ministry where all the employees had been gathered According to one of the people there, he told them to sit down and began speaking to them as if he were the prime minister. He asked about administrative problems and what the main issues were that they were facing. Even if his militia followers have not held on to any of the ministries, Ghwell’s action today has further underlined the ineffectiveness of Faiez Serraj’s administration. Unpaid salaries, lack of cash at the banks, icy weather, floods, water shortages, power cuts, failing communications and collapsing security would seem to make the PC’s position increasingly desperate.